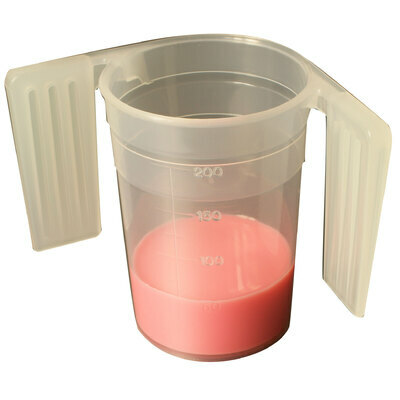 Designed to help monitor the consumption of liquids within your most vulnerable of residents, this Feeding Beaker with Handles 250ml is a durable option. Made from a durable polypropylene, each one features two large and easy grip handles that allow for the independent consumption of liquids while the transparent design ensures the contained amount is constantly monitored. Microwavable and dishwasher safe, these durable feeding beakers can be used with hot and cold liquids with a flattened base that maintains the safety and security of your residents at all times. Our Feeding Cups & Aids collection is full of essential items such as our Napkin Bib Waterproof Large Blue and our matching Wide Spout or Narrow Spout Lids.